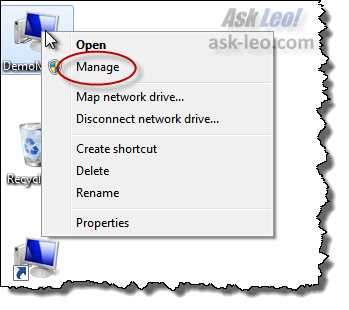 How do I remove a partition in Windows 7? Windows 7 added basic partition management tools that make operations, such as removing a partition and extending another to use the space, very easy. I have a Windows 7 system and by mistake, I have created two partitions. I would like to remove the added partition without doing damage to the original partition. I have not been able to find information on this subject. In the past, this required third-party tools, but as you're using Windows 7, you're in luck: everything that you need is already on your system. I'll show you, step by step and in video, how to remove that partition and how to recover the space that it occupied into the adjacent drive. 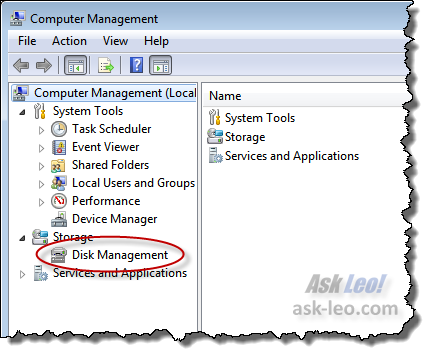 The disk management tool that's always been a part of Windows was upgraded in Windows 7 to allow you to do exactly the kind of partition management task that you're talking about. The "System Reserved" partition where administration information is stored. The "C:" partition, your system drive and typically the drive on which Windows is installed. The "Example Partition (E:)" which is the partition that we want to get rid of. Your computer's disk will almost certainly be quite different, but the concepts here are the same. 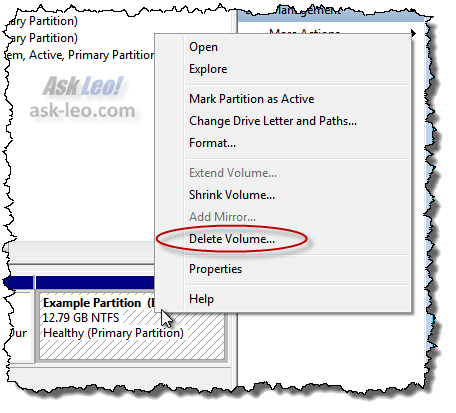 Important: Deleting a volume or partition deletes all of the data that's inside of it. All of it. If there's any data in that partition that you want to keep, STOP! ... and back up that data first. Click Yes when you're ready to delete the partition and everything inside of it. It'll list the available areas on the disk where you can add to the volume that you're extending, or as in our case, it'll simply default to using all of the only available area. All that you need to do is click Next and then Finish. Before deleting that partition, you might want to put some thought into whether or not you might use it instead. Should I partition my hard disk? 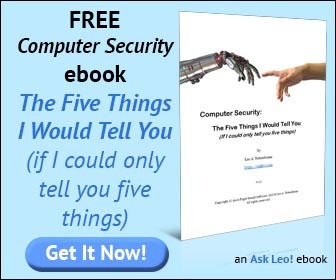 covers the issue; be sure to read the comments there for various points of view. You'll want to make sure that the data on your partitions is properly backed up. How do I backup my computer? has thoughts on what steps you might take. Hello, everyone! This is Leo Notenboom for askleo.net. Today, I'm going to show you how to remove an extra partition on a hard drive using Windows 7. We start by right-clicking on My Computer or whatever your computer happens to be named. You would also find this on your Start menu as 'Computer' or 'My Computer'; right-click on that and select 'Manage'; select 'Disk management' and here we can see on our hard drive, we actually have three partitions: our C: drive, the system reserved partition, and then this example partition I've created that we want to remove. It's very simple. It's a two-step operation: select it to make it current; right-click on it and say 'Delete volume'. Now remember, any time you're working with partition management tools, the risk of or in this case, you are explicitly erasing all of the data on those volumes or partitions; we definitely do want to delete all of the data here. Now, we need to extend the existing C: drive into the space we just released. You'll note that it only works because these two spaces are adjacent to each other. We right-click; we say 'Extend volume'; we have selected the space that's available next to it; which happens to be the unallocated space; we say 'Next'; we say 'Finish' and now, all of a sudden, our C: drive has grown to encompass both of the original C: and E: drives, including space used by the partition we just deleted. I'm Leo Notenboom for askleo.net. How do I resize a partition in Windows XP Windows XP doesn't include built in partition management that will let you resize a partition. Instead, I'll walk through doing it with Linux. 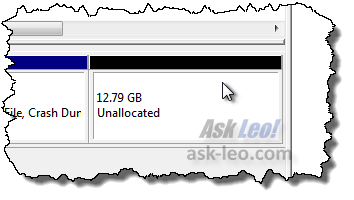 How do I use an "unallocated space" partition in Windows 7? Unallocated space as a hard disk partition is space that won't be used. I'll look at the two common ways to make unallocated space usable. Should I partition my hard disk? Partitioning, or splitting a single physical hard drive into multiple logical drives, has pros and cons. I'll look at those, and make a recommendation. Actually, Windows XP has the "Delete Partition" option in the same place. As often is the case, Microsoft simply changed the name ("partition" to "volume") to give the illusion of progress, like many other annoying changes they make from version to version of their software. The ability to resize or expand a partition was added in Windows 7. A huge addition, in my opinion. And for those of us who don't have the newest version of windows, we must resort to gparted. I was actually surprised that windows got around to doing better at partitioning. The most it could do before 7 was delete partitions. Everything before it had a delete only way of doing this. Even now the 7 one can only do very basic partitioning, and its not on a livecd, so it can have issues with that also. The partition I want to get rid of on my Dell XPS has no letter, it's labelled RECOVERY 16.65 GB NTFS (System, Active, Primary Partition) and lies between a 39 MB (Healthy OEM) partition and my C drive. I have all the recovery and backup I need so I don't need Dell's item. However, Delete Volume is greyed out - I presume because of the "Active" item. Could you fill me in on what's going on and how I can remove it please? It might be possible to delete the volume by booting from a Linux live CD and running gparted, Linux's partition manager. Since, according to hypothesis, your Recovery Partition is undeletable because it is listed as Active, have you as yet attempted to render it Inactive, and if so with what success? Why is everybody speaking its individual language or two? 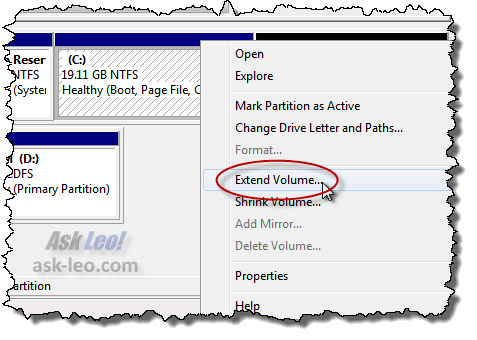 A volume should be a volume, a partition a part of a volume, etc. Not even thinking of drives, disks, and other "entities". Why does MS now again mix volume and partition? in my case it was because there was a paging file on that drive, and I needed first to turn off that page file in "Advanced system settings" for that drive. Be careful in Win 7: Do not delete this partition if it is the System partition, else your computer won't boot.